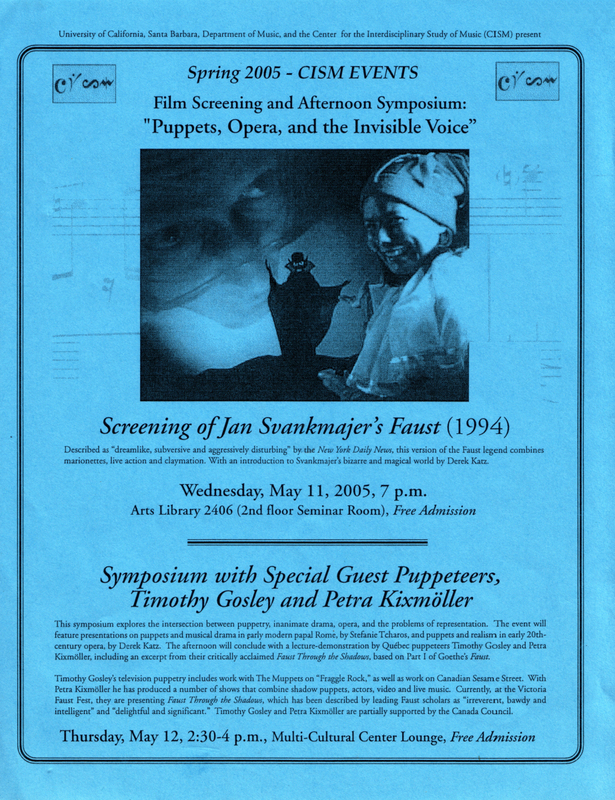 Film Screening and Afternoon Symposium: "Puppets, Opera, and the Invisible Voice"
Described as "dreamlike, subversive and aggressively disturbing" by the New York Daily News, this version of the Faust legend combines marionettes, live action and claymation. With an introduction to Svankmajer's bizarre and magical world of Derek Katz. This symposium explores the intersection between puppetry, inanimate drama, opera, and the problems of representation. The event will feature presentations on puppets and musical drama in early modern papal Rome, by Stefanie Tcharos, and puppets and realism in early 20th-century opera, by Derek Katz. The afternoon will conclude with a lecture-demonstration by Québec puppeteers Timothy Gosley and Petra Kixmöller, including an excerpt from their critically acclaimed Faust Through the Shadows, based on Part I of Goethe's Faust. Timothy Gosley's television puppetry includes work with The Muppets on "Fraggle Rock," as well as work on Canadian Sesame Street. With Petra Kixmöller he has produced a number of shows that combine shadow puppets, asctors, video and live music. Currently, at the Victoria Faust Fest, they are presenting Faust Through the Shadows, which has been described by leading Faust scholars as "irreverent, bawdy and intelligent" and "delightful and significant." Timothy Gosley and Petra Kixmöller are partially supported by the Canada Council.